With AHM Nr. 181 from 22nd February 1943, the coating of the equipment was totally new regulated. In place of the dark-grey/dark-brown coating, which was changed to dark-grey only for the duration of the war, and the brown/grey coating for equipment used in Africa and Crete, the new coating of Dunkelgelb nach Muster – dark yellow after sample – was introduced with immediate effect. The previous camouflage coat should be used for small items of equipment like boxes until further notice. The camouflage finish should now be made by the troop itself. It should be freely combined with the three Tarnpasten – camouflage pastes – of the shades Dunkelgelb nach Muster, Rotbraun – red-brown – RAL 8017 (today Schokoladenbraun – chocolate brown – RAL 8017) and Olivgrün nach Farbtonkasten des RLM für Tarnfarben – olive-green of the colour box of the RLM for camouflage colours. Newly produced equipment and equipment in army ordnance depots hat to be repainted. Equipment of field units should not be repainted. A necessary camouflage should be done by using the three mentioned Tarnpasten. With AHM Nr. 322 from 7th April 1943 it was intimated that the shades Olivgrün nach Farbtonkasten des RLM für Tarnfarben and Dunkelgelb nach Muster were accepted to the RAL Farbtonregister – colour shade register – 840 R. The shade Olivgrün nach Farbtonkasten des RLM für Tarnfarben was now designated Olivgrün – olive green – RAL 6003 and the shade Dunkelgelb nach Muster got the new designation Dunkelgelb – dark yellow – RAL 7028. Most probably, the first dark-yellow shade was developed in the 1930s as Einheitsfarbton – standard colouring. But this was a civilian development. This shade did not enter production at that time. The shade Dunkelgelb nach Muster was developed by the army ordnance office presumably beginning in 1941. Most probably, it went into field trials on the southern sector of the eastern front and in North Africa in 1942. This is proven by exhibits of this time period. The base colour shade Dunkelgelb nach Muster was replaced by the shade Dunkelgelb RAL 7028 only a few weeks after its official introduction. The new shade was admitted to the RAL-Farbtonregister 840 R in March 1943. It could be proven by original colour charts that Dunkelgelb RAL 7028 and Dunkelgelb nach Muster were two totally different colour shades. The shade Dunkelgelb RAL 7028 was less yellow than Dunkelgelb nach Muster. It tended more towards grey-brown. This occurrence was not recorded in any official document! Due to production delays of Dunkelgelb RAL 7028, Dunkelgelb nach Muster was most probably used until autumn 1943 – partly in a brightened variant. The shade Dunkelgelb RAL 7028 was the base colour of the camouflage system to at least autumn 1944. 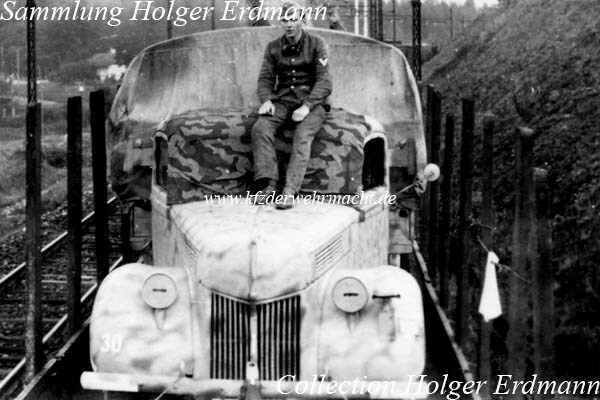 Until summer 1943, the new camouflage coating was implemented to a large extent. This was possible because, for example, it came to a longer silent period on the eastern front between the heavy winter fights and the planned summer offensive which was used for extensive maintenance and overhaul of the equipment. After larger overhaul works, the camouflage cout of the equipment was renewed. In many cases, only a camouflage coat of the mentioned Tarnpasten was applied over the darg-grey base colour which was very effective, too. Later, the dark-yellow colour was not only used for major item of equipment. Other articles of equipment like ammunition crates, helmets, mess kits etc. were painted in dark-yellow, too. The Wehrmacht got its typical appearance of the second half of war due to the dark-yellow shades. This Büssing-NAG 500 A was photographed in spring 1943. The dark-yellow colour was painted as camouflage colour over the dark-gray base colour. The dark-yellow shade on this Henschel type 33 appears a bit darker than on other vehicles with dark-yellow base colour. It could be the shade Dunkelgelb nach Muster. Beginning in February 1943, the dark-yellow colour was applied by the factories. 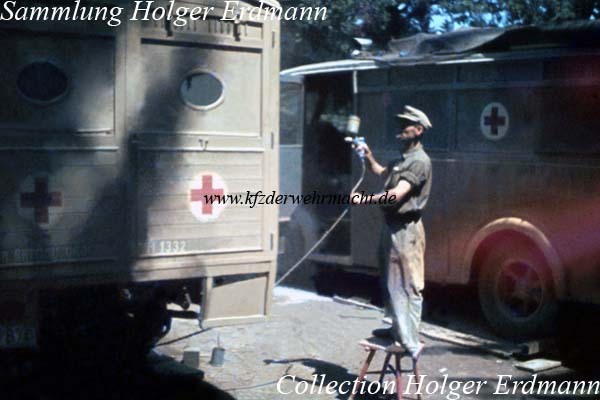 This soldier applied a camouflage finish to a Fiat 626 ambulance with a spray gun. The vehicle was most probably painted in dark-yellow RAL 7028.
is only one example for the multiplicity of possible camouflage patterns. This Borgward B 3000 shows a more solid camouflage pattern consisting of olive-green stripes with red-brown outlines over the dark-yellow base colour. 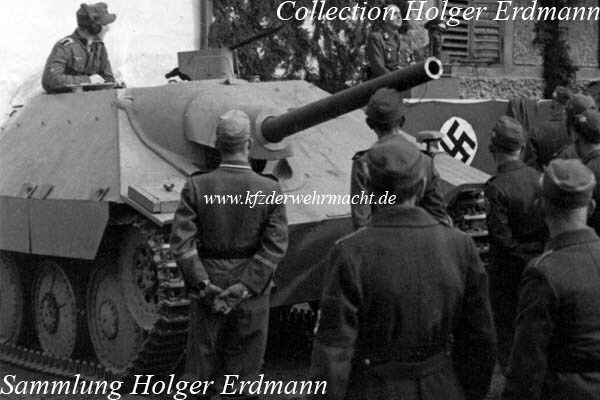 At first sight, this Jagdpanzer 38 of the August 1944 production appears to be painted unicoloured in dark-yellow. But on the lower nose plate one can clearly see a camouflage pattern of at least two colours. This effect is caused by dust and/or sunlight. Beginning in mid-September 1944, the major items of equipment were painted in a three colour camouflage pattern by the factories. Primarily, this was used on armoured vehicles and tanks. If this system was used on not armoured vehicles at this time is questionable. About the same time, the method of applying the camouflage coat was changed. 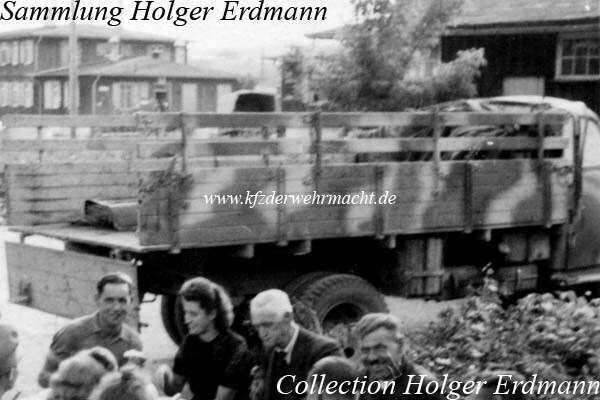 Until this time, the whole vehicle was first completely painted in Dunkelgelb RAL 7028 and the camouflage colours were applied afterwards. Now the camouflage colours were painted directly on the red anti-corrosive paint RAL 3009 – 1/3 Dunkelgelb RAL 7028, 1/3 Olivgrün RAL 6003 and 1/3 Rotbraun RAL 8017. So, about 2/3 dark-yellow paint could be saved. First in October 1944, a new colour chart with the shade Dunkelgelb RAL 7028, Ausgabe 1944 – dark-yellow RAL 7028, version 1944 – was made. Interestingly, this shade corresponds to the Einheitsfarbton of the 1930s to100%. Apparently, the shade Dunkelgelb RAL 7028 could not be produced in sufficient quantities any more due to the tensed raw material situation. In this context it must be considered that many deposits of ochre were located in France and Italy and were lost at that time due to the situation of war. For this reason, the shade Dunkelgelb RAL 7028, Ausgabe 1944 – which was easier to produce – was introduced. But the exact time could not be identified till now. The actions to save dark-yellow paint could be related to the change of the dark-yellow shades, too. Anyhow, the introduction of Dunkelgelb RAL 7028, Ausgabe 1944 could be proven on exhibits of this time period. 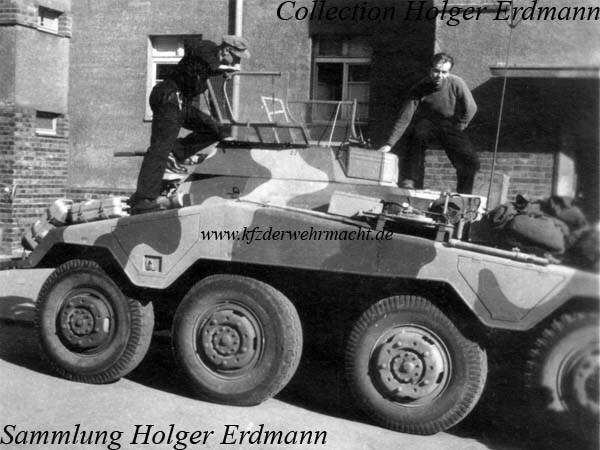 schwere Panzerspähwagen (2cm) (Sd. Kfz. 234/1) is for sure a factory applied camouflage patterns introduced in September 1944. The brightest tone corresponds to Dunkelgelb RAL 7028, the middle tone to Olivgrün RAL 6003 and the darkest tone to Rotbraun RAL 8017. With HV 1945 B, Nr. 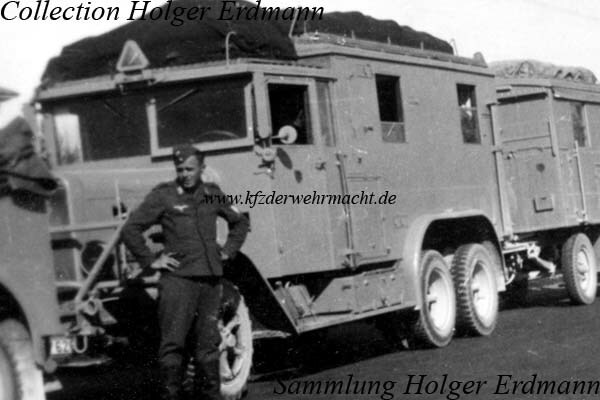 52 of 24th January 1945, it was ordered that Olivgrün RAL 6003 was to be used as the new base colour. This new base colour was most probably introduced only for armoured vehicles and tanks. Possibly, some manufacturers introduced the olive-green base colour before January 1945. 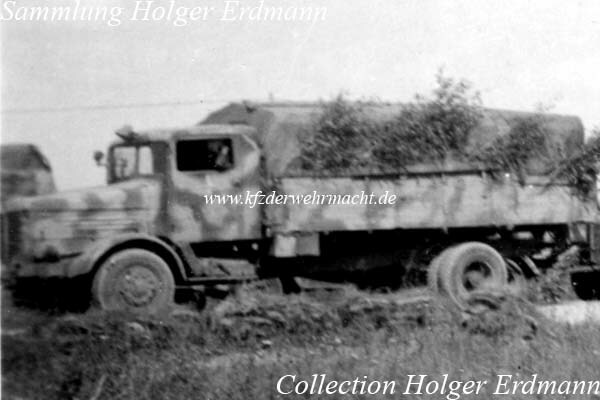 Equipment, which should receive a camouflage coat, should still be painted in each 1/3 Dunkelgelb RAL 7028, Augabe 1944, Olivgrün RAL 6003 and Rotbraun RAL 8017. The camouflage pattern should be made based on a Tarnbild – camouflage master – which was sent to the companies by the army ordnance office. The dark-yellow base coat was prohibited for mayor items of equipment, which was transported on open rail wagons. However, the delivery of equipment should not be interrupted due to missing olive- green colour. All possible variants of camouflage patterns appeared in the last weeks of war. One had to use the colours which were available. 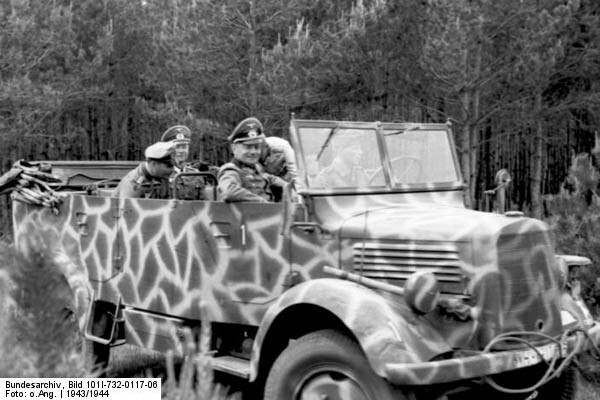 In the last days of war, vehicles in the red anti-corrosive paint with or without camouflage colours were delivered, too.